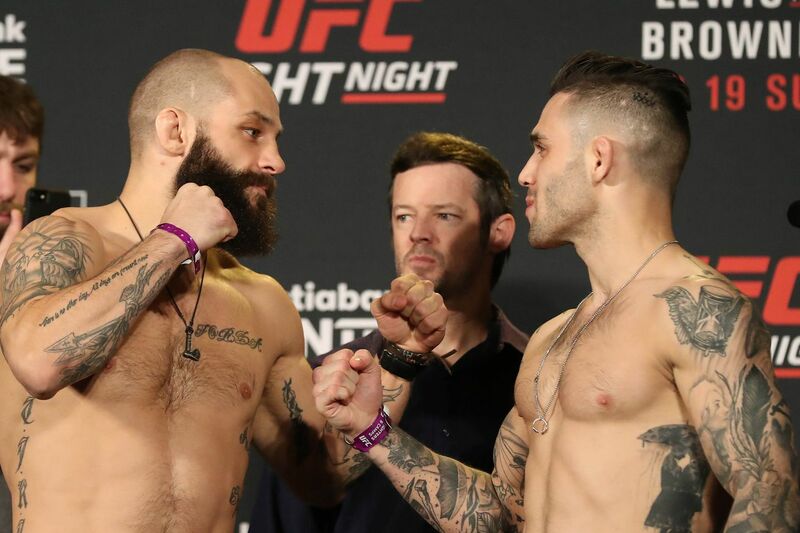 Featherweights Sam Sicilia and Gavin Tucker took to the Octagon to scrap Sunday night (Feb. 19, 2017) at UFC Fight Night 105: “Lewis vs. Browne,” which took place inside Scotiabank Centre in Halifax, Nova Scotia, Canada, live on FOX Sports 1. Tucker, a native of Newfoundland, trains out of Halifax and had the crowd on his side. He opened up with fast leg kicks, moving in and out. Sicilia landed a straight kick to the breadbasket. Tucker darted in and hit a high kick off the arms. Tucker was moving on the outside, piling up kicks and taking his head off-line on his entries. Sicilia seemed to be waiting on him. Tucker landed a nice uppercut, then a right hook. He landed a body kick, then feinted in for another. Sicilia, getting outworked, tried to pressure Tucker to the cage. Tucker kept using his feints to keep Sam guessing at range. He doubled up on his left straight, then landed a nice knee and ducked the counter hook. Tucker picked up where he left off to start the second round, feinting his way in and landing kicks as Sicilia backed up. Sicilia ate a leg kick, then a high kick. Tucker was making the most of a clear speed advantage. Sam checked a kick, but was having trouble pinning Tucker down. Tucker began to style, dancing away and running his hand through his hair. He landed a jab, then countered Sicilia’s return with a left straight. Sicilia took advantage of Tucker staying in the pocket longer to land a right hand. Tucker landed a Frankie Edgar-like combination, throwing hands into a leg kick and ducking out under the counter. The crowd began to cheer for the hometown hero as the round ended. Sicilia was letting his hands go at the beginning of round three. Tucker did the Ali dance. He blocked a right hand and ducked the follow-up, but Sicilia seemed to stun him a bit even through the gloves. Sicilia bit down and threw into the clinch. Tucker shuffled side to side and hit a gorgeous takedown, but let Sicilia up after a leglock attempt. He was stance switching, sliding just out of range of Sicilia’s more static strikes. Sicilia barged forward, trying to find his elusive foe. He landed a hook, but missed many more. Tucker clinched and landed a knee, then pointed at Scilia’s body and laughed, then landed two hard body kicks. He ducked out smoothly under a counter. The crowd reached a crescendo as the bell sounded, a clear debut win for the hometown hero, Gavin Tucker. Very impressive debut for undefeated Gavin Tucker, the best I have seen in a long time. His girlfriend cries as the results are read. Tucker says in the post-fight interview that he wasn’t hurt by Sicilia’s right hand and says they don’t come tougher than himself. He says that with more than a month’s notice, he didn’t think he would have been touched at all. Tucker will be one to watch at featherweight. For complete UFC Fight Night 105: “Lewis vs. Browne” play-by-play updates and results click here.